In this quote, FDR is describing his 1936 trip to the Dust Bowl: a 150,000-square-mile area, including the Oklahoma and Texas panhandles and bordering sections of Kansas, Colorado, and New Mexico that was struck by what some scientists believe to be the most severe drought in 300 years. The massive problem started when the drought killed crops that kept the soil in place. 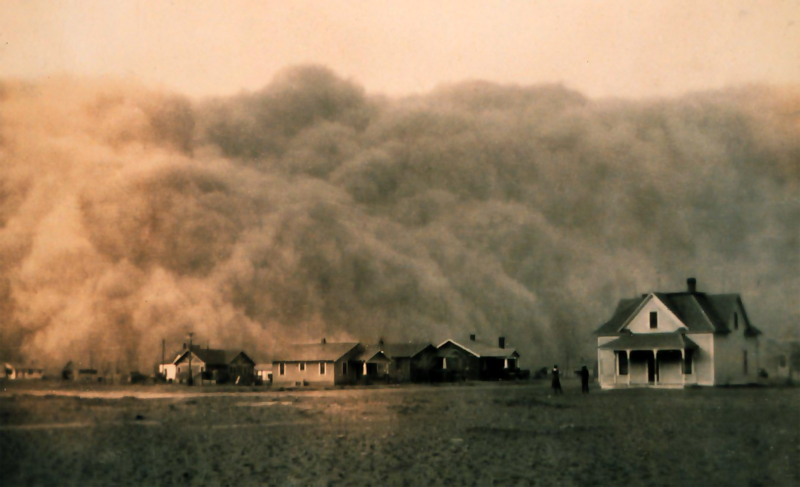 Then intense winds raised gigantic dust clouds that would completely cover homes, suffocate livestock and caused pneumonia in many children. It was so strong and unyielding that it even blew dust all the way to Washington, D.C. But how does North Carolina tie into the Dust Bowl? 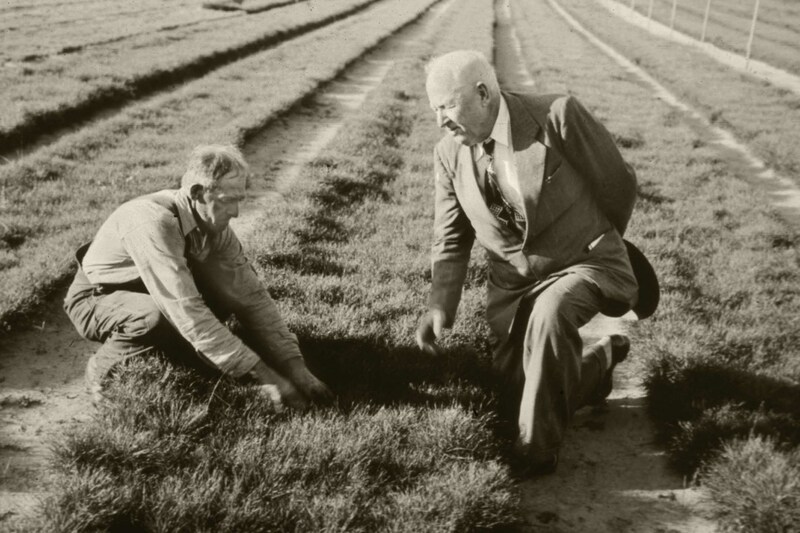 North Carolina (Wadesboro) is home to the Father of Soil Conservation, Dr. Hugh Hammond Bennett. After accepting a job with the USDA Bureau of Soils in 1903, Bennett went on to spend the next three decades studying soils across the US and abroad, and he became convinced that soil erosion was “the biggest problem confronting the farmers of the Nation over a tremendous part of its agricultural lands.” Soil conservation became his life’s work. Dr. Bennett was a smart man and a great communicator. He knew that he needed to drive the point home to Congress so they would understand soil erosion as the “National Menace”. 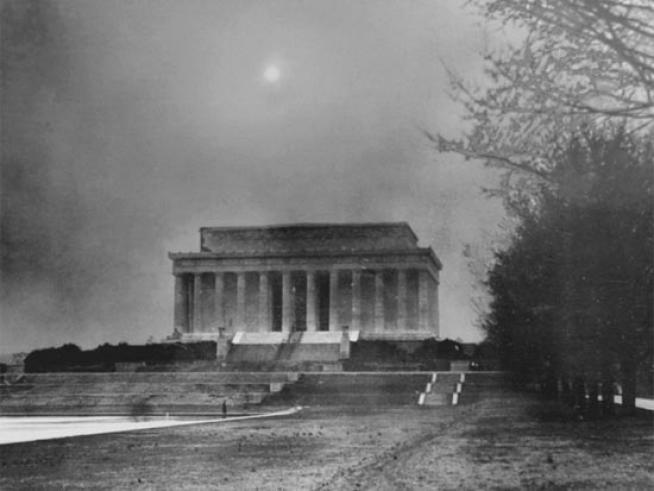 The story goes that in 1935, he started tracking a large dust storm traveling from Oklahoma to Washington, D.C. He began his plea to Congress and had a runner staged to bring updates of the storm’s movement. At the pivotal point, he stepped down from the podium and threw open the window. As the soil flew in he said, “Gentlemen, that is Oklahoma,” – and with that, the Soil Conservation Act was passed. Why did he recommend soil and water conservation districts? Dr. Bennett understood the fundamental aspect of our society: we lead by example and want to keep up with our neighbors. If one neighbor makes an improvement on their property and their crop yields increase, the next neighbor will want to try it out. He needed a system of farmer advocates that could spread the “locally led” conservation message. And after doing extensive field work, Dr. Bennett developed a list of best practices, and secured federal resources to establish the Soil Conservation Service. North Carolina conservation partners are proud of our conservation heritage and it shows across the landscape. The partnership has grown from a federal agency providing technical assistance, to private landowners with a board of local citizens overseeing projects in the watershed, to a soil and water conservation district in every county of the state. Take a look the next time you vote, soil and water conservation district supervisors are last on the ballot, but do more good work for our environment than most of the other politicians combined. Soil and water conservation is all about voluntary conservation on private lands. We aren’t here to regulate farming practices; instead, we offer a suite of services to promote farming in a sustainable and environmentally friendly manner. Want to keep your field from eroding into the stream? Plant some ground cover and fence the cattle out of the creek. Want to increase your soil productions? Test your soils and apply fertilizer at the appropriate rates. We are the farmer’s friend, “helping people help the land,” because the farmer is the first conservationist and the first line of defense. Soil and water conservation best practices keep sediment out of the creek and keeps fertilizers in place to grow the crops – not algae blooms. Over 90% of the land in North Carolina is privately owned, and these working lands support a great deal of ecosystem services that operate in the backdrop of our lives, providing clean water, quality air, and good foods. Soil and water conservation districts are the fulcrum of landscape-scale conservation, connecting the dots and implementing plans from a holistic perspective. Soil and water conservation districts offer natural resource management tools in the urban setting as well. Ever notice the muck that accumulates in parking lots? Eventually, it all flows into the creeks and streams during big storms. But by developing and utilizing urban best practices for storm water, we can limit the movement of pollutants into our waterways. Everyone downstream benefits, from good fish habitats to cheaper water bills. Today the core of the conservation partnership is that local soil and water conservation district, setting county priorities for allocating resources and offering free technical services to the most pressing natural resource issues. The districts are supported by their state partner in the NC Department of Agriculture and Consumer Services, the Division of Soil and Water Conservation. Our federal partners with USDA Natural Resources Conservation Service leverage significant financial resources and establish the standards that all best practices are built to. The conservation partnership is supported by a broad array of other groups and businesses who unify their efforts through the NC Foundation for Soil and Water Conservation. We offer common ground and a way to make a difference for agriculture organizations like NC Farm Bureau, NC Pork Council, NC State Grange, and NC Forestry Association; utility providers like Duke Energy and electric co-ops; business entities like farm credits and Smithfield Foods; and private citizens. All of these various interests come together with soil and water conservation districts to support natural resource management in a meaningful way. We leverage private resources to offset the rising costs of doing conservation so that we leave the Old North State better than we found it. So I challenge you, get involved in your local community! Go in and talk to your conservation district. Tell your neighbor about conservation resources. (Conservation partners do much more than implement best practices. We offer educational outreach opportunities, and we are the organization that local government can rely on to give sound natural resource management advice.) And if you are really motivated, run for office with the soil and water conservation district. We’ve come a long way since the Dust Bowl, but it’s still important that we do everything we can to help those who cultivate the earth do so in a responsible manner. It can take up to 500 years to create one inch of soil, so we have to think big when it comes to soil conservation. Dr. Bennett stressed this long-view philosophy to President Roosevelt, who came to understand “The Nation that destroys its soil, destroys itself.” Today may we all live up to the legacy of conservation and be better stewards of the land.